The wind is caused by the sun, the differences in heating between the poles and the equator, differences in air pressure, the rotation of the earth and the curvature of the earth. Together these factors create all types of winds, including low level surface winds to higher atmospheric jet stream winds. Earth’s winds can range from a few knots (1.15 mph or 1.85 kph) to over 200 knots, all of which carry energy. Because there is so much energy to be extracted from the wind, wind energy is currently one of the largest and most profitable renewable energy industries in the world. 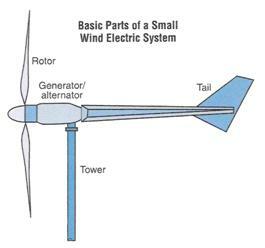 At the basic level, generating electricity from the wind is pretty straight forward, i.e., the wind spins a propeller that is attached to an electric generator or turbine that generates electricity. However, the actual science involved is quite complex (see Energy and Cost Calculations – Wind Turbines article this web site). 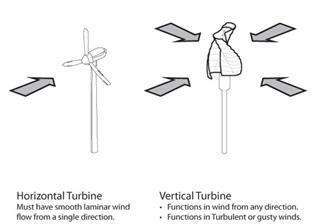 There are many variations to wind turbine design. On a small scale wind generators are used on boats, campers, mobile homes, remote home locations, etc. These range in power output from around 40 watts to 10 kilowatts (10,000 watts), but can also go as high as 1 megawatt (1 million watts) (see wind turbines available at http://www.allsmallwindturbines.com/). 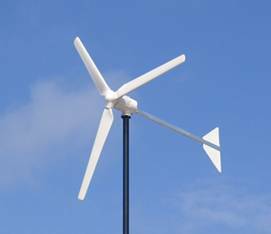 Small wind generators are guided into the wind by a wind vane, have a direct drive generator and produce DC electricity. On an industrial scale, where wind turbines are used by a utility company or on wind farms, they can range from 1 to 7.5 megawatts, and 10 megawatt wind turbines are under development. 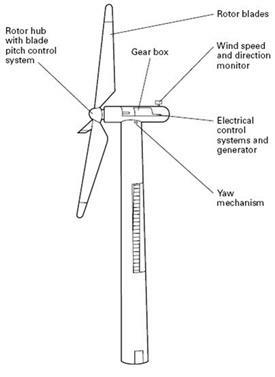 Large wind turbines are guided into the wind by computer controlled motors, use a gear box that allows for variable generator speed and usually produce AC electricity. HAWTs are the most common type of wind turbine due to the generally greater efficiency, ease of maintenance and versatility of design, although at industrial sizes the transportation of parts and the installation procedures can pose difficulties. VAWTs are less common due to lower efficiencies, height limitations and greater complexity of construction at large sizes. 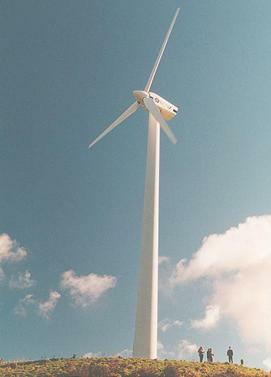 Their main advantages include the ability to access wind from all directions and therefore no need to be guided into the wind, the ability to access wind closer to the ground, lower wind startup speeds and lower noise signatures, all of which are making them an increasingly interesting option for urbanized areas. 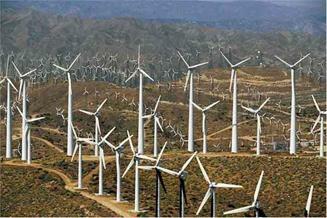 A wind farm is an area where multiple wind turbines generate electricity that is predominantly sent to the grid. 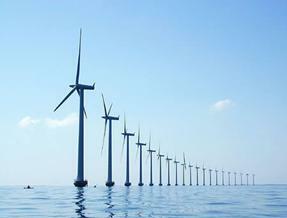 Wind farms exist on land, or in the sea. On land they are called onshore wind farms and in the sea they are called nearshore or offshore wind farms, depending on their distance from the shore. Nearshore wind farms are within three kilometers of the shoreline, whereas offshore ones are generally ten kilometers beyond the shoreline. Wind farms range from a few dozen to several hundred wind turbines. The largest wind farm called The Roscoe Wind Farm in the state of Texas in the U.S. is a 780 megawatt wind farm with 627 wind turbines and covering nearly 400 sq. kilometers or 156 sq. miles of land. These factors are studied and tested until satisfactory results allow for construction. When sending power to the grid most wind farms, like power stations, need a transformer to step up the voltage.